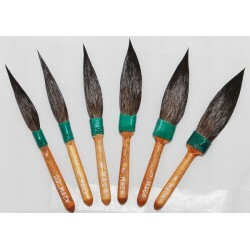 Buy Series 30 mack brush Dagger Pinstripe Brushes by Mack Brush, buy these brushes for detail pinstriping, auto body touch-up, for pulling long lines while pin-striping. Have you ever tried a Dagger? They are Great, easier to use than a Sword, because they have 2 side and work like a Pencil. These amazing Daggers are not well known and a must have in every sign or pinstripe kit. yeah yeah, everyone says get a sword, go ahead, but you'll be missing out, try a Dagger and get more control. Dagger Striper Brush Series-30 Size 0 by Mack Brush Available in Sizes 00-4 Squirrel Hair Dagger Stripers 100% Pure Unmixed S..
Dagger Striper Brush Series-30 Size 1 Mack Brush Series 30 Available in Sizes 00-4 Squirrel Hair Dagger Stripers 100% Pure Unmixed Squirrel Hair Strip..
Dagger Striper Brush Series-30 Size 2 by Mack Brush Series 30 available in Sizes 00-4 Squirrel Hair Dagger Stripers 100% Pure Unmixed S..
Dagger Striper Brush Series-30 Size 3 by Mack Brush Series 30 available in Sizes 00-4 Squirrel Hair Dagger Stripers 100% Pure..
Dagger Striper Brush Series-30 Size 4 by Mack Brush Series 30 available in Sizes 00-4 Squirrel Hair Dagger Stripers 100% Pure Unmixed ..
Mack brush dagger striping brushes series 30 full set, sizes 00-4 by the Andrew Mack Brush Company. This Value Pack comes with 6 pinstriping brus..